Steve Littler up at the front with a good grainy mob in tow. Mid January is a period for half marathon races as runners kick off their spring marathon training before digging into the long distance mileage, with many already having been preparing in the run up to Christmas and the New Year, a period that also allows some relaxed training. The Inskip Half marathon was rewarded with 217 runners and after the bitter driving sleet of 2018 the weather was gorgeous for the duration with no wind and a warming sun. There was good quality at the front as Salford Harriers and DH Runners turned out high quality squads. 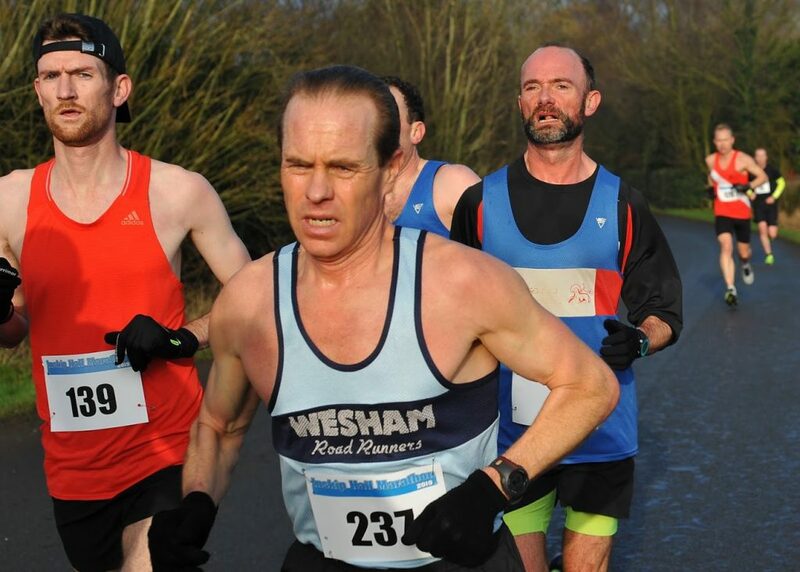 Wesham’s Steve Littler was right up there with the pace, coming in 3rd and 1st M45 in 1:13:59 chasing down Salford winner Dave Rigby (1:12:08) and Barlick’s Jonathan Cleaver (1:12:31). Simon Denye ran well for 23rd place and 5th M45 in 1:21:23. Lee Barlow came through for 28th place and 6th M45 in 1:23:29, with Neil Gregson taking 3 minutes off his previous best performance for 1:29:31 and 47th place. The Wesham men came in 5th on a 3-man score and 3rd on a 4-man team, behind Preston, Salford and DH Runners winners of both categories. Debbie Myerscough was Wesham’s only woman runner and she was fighting the after effects of the bad cold virus that has been circulating for the last 3 weeks. She bravely soldiered round the course finishing 67th woman, 11th W55 and 216th overall in 2:31:44, a tremendous effort. Women’s winner was April Caufield of Halifax Harriers in 1:27:53 for 41st place overall. Steve Myerscough picked up pace throughout the race, finishing 50th and 10th M40 in 1:30:20. Lee Nixon had a great run for a new personal best time of 1:33:43 in 63rd place. Peter Cruse was running steady with injury to finish 4th M55 and 68th overall in 1:35:08. Rob Wallace came in 85th in 1:38:47; Thomas Farquhar 98th in 1:42:14; and Ben Wrigley 104th in in 1:44:35. Kath Hoyer ran the Mast Race 10k in the Smithills Country Park on Saturday and finished 11th woman and 102nd in 55:16 for 5km uphill and 5km downhill. There were 10 Wesham runners at the Lytham Hall parkrun on Saturday morning in dull and gloomy conditions with early drizzle. Chris Hastwell was the first finisher in 18:58 for an M35 age graded performance of 69.51%. Arran Galvin was close behind in 19:01 for M35 70.73%. Jonathan Lawson came in with 21:43 for an M50 grade of 68.46%. Ben Wrigley had an excellent run with 23:41 for M35 56.79%. Sharon Cooper clocked 23:57 for W45 66.32%; Stephen Twist 25:31 with M50 grade 58.72%; Graham Cunliffe 26:01 with an M60 62.72%. Andrew Moore clocked 26:08 for M55 59.82%; Fran Hodskinson ran 27:15 with W50 61.53%; and Phil Leaver still not right with breathlessness running 28:19 for M65 59.21%. In the Preston run Steve Abbott ran a good 18:44 for M40 73.93%; Dave Marsland 24:06 with an M60 grade of 68.33%; and Robert Brown clocked 25:55 for an M60 62.44%. In the Victoria Park run in St Helens Chris Pike ran 27:22 for M40 51.04%; and Martin Bates ran the Worsley Woods run in north-west Manchester in 23:12 for an M60 70.33%. In Blackpool’s Stanley Park Finlay McCalman ran 27:33 for M50 55.29%; Rob Wallace clocked 27:47 for a senior age grade 46.43%, and Dave Young ran 28:23 for M70 62.89%. In Bakewell Emma Wright ran 30:22 for W40 50.66%, and at Clitheroe Castle the parkrun tourists Vicky Gore clocked 28:51 for W40 54.13%; Megan Gore 34:50 for JW11 46.75% and Steven Gore 34:51 in a support role. On Fleetwood Promenade George Kennedy ran 23:18 for M60 69.46% with Suzanne Leonard 23:19 and W45 70.19%. Brian Jones ran 31:16 with a rounded M55 grade of 50.00%. In the Westpark run in Munich Gary Moore clocked 24:48 for M55 63.58%, his fifth parkrun and debut here.